Many cultures and families have recipes that have become traditional for Easter meals. This page contains traditional Easter recipes. Mix well. Make pie crust, sprinkle black pepper in the pie crust. Roll out to fit 2 9x13 inch cake pans. Divide the mixture into both cake pans. Bake at 350 degrees F till golden on top, maybe 1 to 1 1/2 hours. My family makes this at Easter, but not on Good Friday. Can be served warm or cold. Enjoy! Source: This is our family Easter side dish. Naples and Calabria, Italy. We want to make Ukrainian Easter paska, but the recipe says to bake it in a coffee can. Coffee cans are now cardboard. Anyone have any suggestions? If anyone has ever made this bread, any advice would be appreciated. Also: any idea if this can be made in a bread machine? You can use any food grade tin can. Coffee cans just tended to be larger. Use the dough cycle. Can add half a cup of raisins at the add ingredients signal or at the last mix cycle. Place in greased/Pam sprayed pan(s) Use any round pan. Let rise for 30-45 minutes in a warm place. Bake 35-40 minutes in a preheated 325 degree F oven. Can coat dough with an egg wash before baking, or top with a glaze after partly cooled. Makes 1 large or 2 smaller loaves. 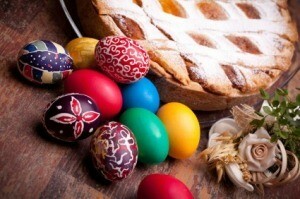 I am looking for a recipe for Italian Easter bread made with anise extract. It is a yeast bread and contains no fruit or nuts. Here is a link for Italian Easter Bread video recipe that should help you out. How much oil do you use in one recipe? Ready in: 2-5 hrs ? In a large bowl, thoroughly mix 1 1/2 cups flour, sugar, salt and undissolved yeast. Combine milk and margarine in a saucepan. Heat over low heat until liquids are warm. (Margarine doesn't need to melt.) Remove from heat and add anise oil and yellow food coloring to make a "buttery" yellow color. Gradually add to dry ingredients and beat 2 minutes at medium speed of electric mixer, scraping bowl occasionally. Add 3 eggs and 1/2 cup flour, or enough flour to make a thick batter. Beat a high speed 2 minutes, scraping bowl occasionally. Add enough additional flour to make a soft dough. Turn out onto lightly floured board; knead until smooth and elastic, about 8 to 10 minutes. Place in greased bowl, turning to grease top. Cover with a clean dishcloth or plastic wrap; let rise in warm place, free from draft, until doubled in bulk, about 1 hour. Punch dough down. Cover; let rise again until almost double, about 30 minutes. Punch dough down again; turn out onto lightly floured board. Divide in half; form into two large round balls or a dozen "buns". Place on opposite corners of a greased baking sheet. Cut a cross 1/2-inch deep on top of each ball. Cover; let rise in warm place, free from draft, until doubled in bulk, about 1 hour. Beat 1 egg the 1 tablespoon water. Use to brush tops of loaves. Bake in moderate oven (350 degrees F.) about 35 to 45 min. (15 to 20 for buns), or until done. Remove from baking sheet and cool on wire racks. 191 calories, 5 grams fat, 31 grams carbohydrates, 5 grams protein per slice. This recipe is low in fat.